3 x 1/2盎司2015年澳大利亚高浮雕精制银币系列 | ?? The Australian High Relief silver proof coin set celebrates the Perth Mint's popular bullion coins in high relief. All of the coins are struck on concave surfaces on both sides which creates the detailed high relief finish. The kangaroo coin captures the design of the 2015 bullion Kangaroo coins, with a kangaroo hopping across the outback at dusk and the moon in the background. The koala coin mimics the 2015 Koala coins, with an adult koala sitting in a eucalyptus tree in a rural setting. 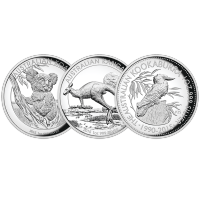 The Kookaburra coin features the same design as found on the 2015 25th anniversary Kookaburra coins. The kookaburra is surrounded by eucalyptus and fern leaves. This set includes a certificate of authenticity and ships in a three coin display box packed inside a full colour graphic box. Limited mintage of only 1000 sets mean this set will have enduring value.